Well, ever since I discovered aquafaba, I’ve been having so much fun playing with it! This really is a game-changer for those who have egg allergies, or who are vegan. It opens up a whole world of possibilities! Earlier, I made meringues, and I’m looking forward to trying macarons, souffles, even drinks! 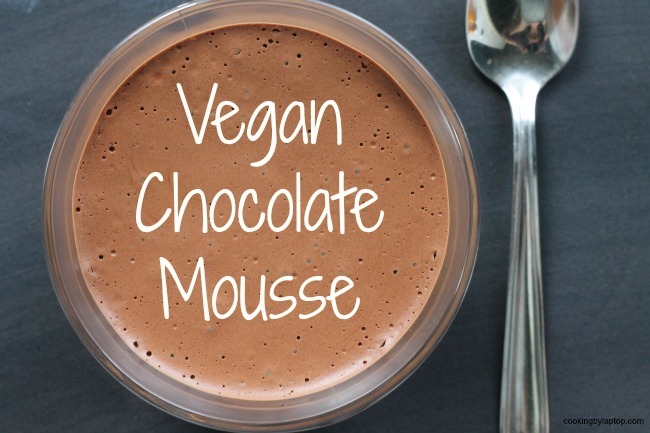 Last night, I made this super easy, delicious vegan chocolate mousse. It took about 10 minutes to make, and my son didn’t even know it was vegan. It disappeared in about 10 seconds. The greatest thing about this recipe is that it creates a true mousse that is light and airy. You just can’t get this kind of texture with silken tofu! Drain the chickpeas and reserve the liquid. Use the chickpeas for something else. Take 2/3 cup of the chickpea liquid, and add it to the bowl of your stand mixer, along with the sugar and cream of tartar. Turn it on, slowly at first, and then building up to a high speed. Whip the aquafaba for about 10 minutes, or until it peaks. Meanwhile, melt the chocolate in a bowl over boiling water, until it is smooth. Allow to cool slightly. Carefully fold the melted chocolate into the aquafaba. Pour into individual ramekins and refrigerate until solid, about 30 to 60 minutes. Garnish with coconut cream, grated chocolate or coconut flakes, if desired. If you liked this recipe, check out this variation: Raspberry Chocolate Mousse Pie! Sounds awesome. Will definitely be trying it! Oh goodness. If vegan meringues got me excited and eager to try the chickpea fluff this takes it even further. I have to try this! That looks heavenly! Can’t wait to have a try with this genius ingredient! I’ve been seeing so many aquafaba recipes popping up everywhere and I haven’t really been on board. The idea of that chickpea water isn’t the most appealing thing to me 🙂 BUT, I think this recipe has won me over. 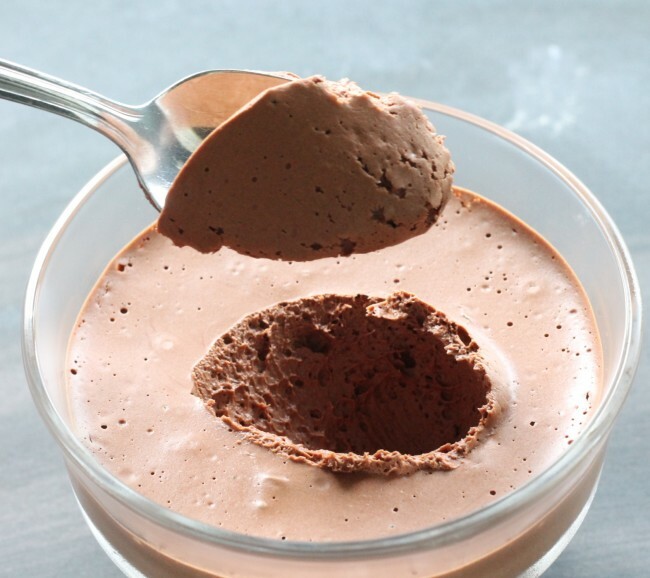 I LOVE chocolate mousse and the looks of it in your pictures, makes me want to make it. I was skeptical, too, but after I tried it a few times, I was hooked! I have a vegan lemon meringue pie coming up on the blog this week! Thank u for such a wonderful recepe. I tried it but when I folded d chocolate mixture in d fluff it lost its fluffiness n it became runny. Where do u think I went wrong. Secondly can I start beating d aqua faba straight fr d refrigerator. I’m not sure why your AF deflated when you started to add the chocolate. You do have to make sure the chocolate is cooled a little, and also be very gentle when you fold it into the AF mixture. Also make sure your AF is very stiffly beaten. You should be able to turn the bowl upside down, and it will not shift. Yes, you can use it straight from the fridge, or even room temp, I think, although I’ve read that cold AF whips up better. Just made this and it is great! I used 100% cacao unsweetened. I was worried that it would be too bitter so added more sugar but it ended up a little too sweet…should have followed your recipe closer! The chocolate got grainy. I melted it over a pot of simmering water. According to my google research, the steam from the water can make it seize up, so I’ll have to use more care next time (I don’t have a microwave). Thanks for posting!! Yay! Glad to hear it! I like things a little more on the bitter side, too. Chocolate is notoriously difficult. I usually use a pot that is slightly smaller than my bowl, so that there isn’t any steam escaping. Bon Appetite! Can’t wait to try this for my husband – he’s certifiably nutty about chocolate, but not too sure about aquafaba. We’re both new to the vegan lifestyle, and we are on a sharply inclined learning curve! Thanks for sharing! Just made this today. It has great flavor but the texture is not of mousse. I followed your directions and read through and tried to see where people were having success. I used 85% bittersweet cacao and added a a bit of vanilla to keep it from getting grainy….or so I thought. I beat until I had stiff peaks and folded in the melted chocolate. It reduced way down, got a little watery and grainy. Any other tips??? How hot was the chocolate? Did you let it cool a little before folding it in? It’s normal for the meringue to fall a little when you fold in the chocolate, you just have to be really delicate with it, and aquafaba is not as stable as egg whites. Did you include the sugar and the cream of tartar? It really helps to stabilize. My chocolate solidified when I drizzled it into the whipped bean juice. Should I be adding it all at once? Can you give a few more details on the folding in part? Can you provide the precise quantity of chickpea liquid the use? ( Instead of ” “2/3 of what is in a can.) Thank you. This was one of the first AF recipes I ever did, so I was a bit clueless about it back then! I’ve now written a cookbook that will be published in the spring, and this recipe is in it. I am so happy to find this recipe I could cry! I don’t tolerate dairy well and never thought I’d get to enjoy chocolate mousse again. My 11 yr old son and I gave this a go and I can’t believe how good this is. If I didn’t know it was vegan, I wouldn’t know it was vegan. Additions: I added a tiny pinch of salt to the melted chocolate because salt seems to help point up the flavor of chocolate. And I added a tiny bit of vanilla as well to the melted chocolate (same reason), but next time I think I’ll add that to the aquafaba. Thank you for a brilliant recipe! It turned our cold, gray winter day stuck indoors into a fun and tasty afternoon! NICE! So happy for you! And AJ, it’s exactly for folks like you that I’m writing my cookbook–so you can start to have those foods again that you like, but were unable to eat because of the eggs. I asked my partner to get me lots of cans of chickpeas to make this delicious recipe, bless him he did, but I don’t believe it they are all in salted water! Can I still use the salted water at all or would it spoil the taste/texture? I think it will be okay, as the amount of salt isn’t huge–at least here in Canada, I’m not sure about how yours are in the UK. Unfortunately, the same happened to me. The aqua fab was a success, and I did cool the chocolate, but as soon as I folded in the chocolate, the aqua fab deflated. It will definitely deflate some, but it should still remain airy enough to make a fluff mousse after it’s set in the fridge. I tried it several times, making sure to cool the chocolate and adding cream of tartar to the aquafaba, but still it came out soupy and grainy on the bottom, instead of fluffy and stiff. Does anyone know how to correct this? Thank you. How long did you let the chocolate cool for? It doesn’t need to be a really long time. Also, did you make sure to beat your AF until it was really stiff? I usually do it for up to 10 minutes you can’t overbeat AF. I just made it and it turned out great. I used Lindt 90% supreme dark chocolate and the flavor is really intense. I may try a 60% chocolate next time. Thank you for putting this recipe out there. Hello, I’m confused about recipe. On your video you said, to use 1/3 cup aquafaba, however, recipe says 2/3 cup. I think I halved the recipe for the video. Either one will work, it’s all proportional. 1/3 cup AF will make about 2-3 servings, 2/3 cup will make 4-6. I would follow the written recipe for the best results.